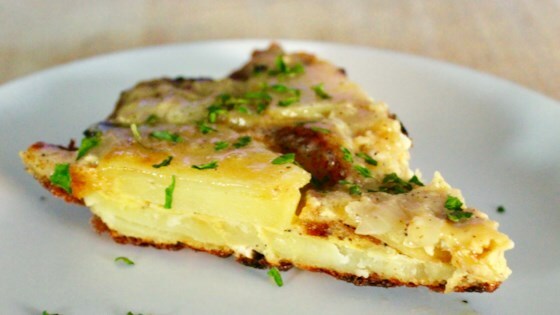 "Unlike most omelets, a Spanish tortilla is served at room temperature. It is the classic tapa, prepared all over Spain." Heat 1/2 cup olive oil in a large skillet over medium-low heat. Add half of the potato slices, and cook, stirring occasionally, until just tender, 15 to 20 minutes. When done, remove potatoes to a large bowl, leaving oil in the skillet. Cook the remaining potatoes in the oil until tender, then add to the bowl, leaving oil in the skillet. Gently toss potatoes with salt and pepper to taste. Meanwhile, heat 2 tablespoons olive oil in a skillet over medium heat. Stir in onion rings, and gently cook until soft and golden brown, about 15 minutes. Spoon onions onto a plate, and allow to cool while the potatoes finish cooking. Whisk eggs in a large bowl until smooth. Stir in cooled onions, roasted peppers, and serrano ham. Gently fold in cooked potatoes. Slide the tortilla onto a serving plate and allow to cool to room temperature. Cut into six wedges and sprinkle with parsley to serve. This was fabulous! I lived in spain for 1 1/2 years and ate these a lot. The onions and pepper add a lot of flavor as I don';t care for plain eggs.